DHY-04G Single Automatic GSM Hybrid, AES/EBU & Analogue I/O With Ethernet. A new addition to the DHY-04 range is the ability for the DHY-04G version to be used on a GSM cellular (mobile) phone network instead of a telephone (POTS) line. The DHY-04G can accept a SIM card in the rear panel slot and by connecting a suitable GSM antenna, the DHY-04G can receive and make high quality broadcast calls over the cellular network, converting the GSM call to the 4 wire audio signal to and from a connected mixing console. The GSM module used in the DHY-04G is quad-band GSM, so it can take and make calls on any 2G network. Ideal for studios in remote locations, for OB vans and trucks on the move, and in emergency situations where a telephone landline can’t be guaranteed, the DHY-04G offers outstanding performance. The DHY-04G has all features of the DHY-04 (read cellphone/mobile features instead of telephony features in the listed bullet point specification) together with some additional front panel indicators. There are two LEDs, one for SIM enabled and one for GSM Network availability. Additionally there is a push button which allows the GSM signal level to be displayed on the meter LEDs. 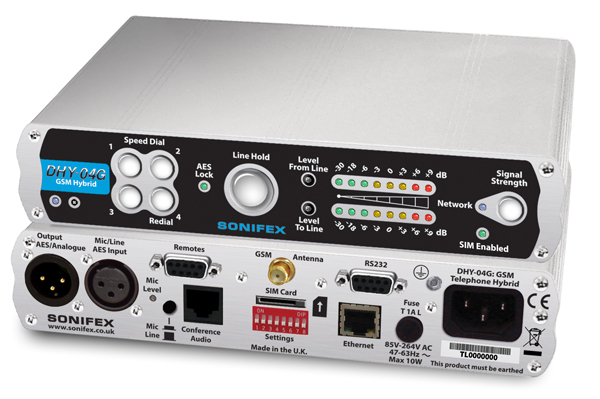 The Sonifex Dialler is a Windows ™7/8 and Windows™ 10 application for simple connection and control of a single DHY-04/G hybrid. 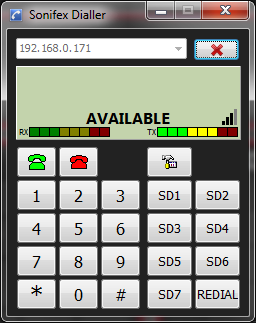 To connect to a hybrid, simply enter/select the TCP/IP address in the drop-down list at the top left of the screen, then click the connect button. The dialler has a numeric keypad, speed dials, last number re-dial, Rx and Tx metering, status indicator. There is also signal strength indicator when connected to a hybrid with a GSM module. *Depth is measured from the front to the end of the connectors fitted to the back of the unit.